Flexible Metal Conduit Type- ABR ALUMINUM “BLUE RIBBON” This non-jacketed flexible aluminum conduit has many universal wiring applications. It is often referred to as “Greenfield” or “Reduced Wall Flex”. APPLICATION: This conduit is intended for installation as a metal raceway for wires and cable in accordance with NEC® (ANSI/NFPA-70) Article 348. Listed File #E53253 (sizes 3/8 &1/2 through 3 inch). 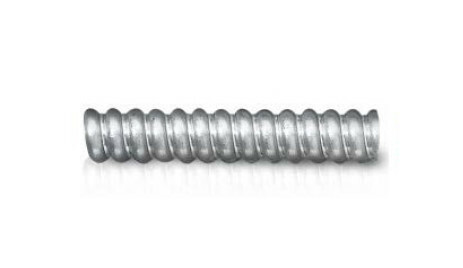 Conforms to Underwriters Laboratories Standard ANSI/UL-1 for Flexible Metal Conduit. Download the Flexible Metal Conduit Type- ABR spec sheet below or call 714.835.6211 for more information.